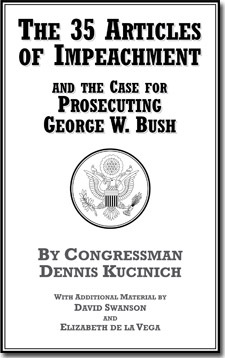 Feral House offers this important and urgent publication of Dennis Kucinich’s Articles of Impeachment in two formats: an offset-printed paperback book available for the cost of $12 and a free downloadable PDF available below. David Swanson’s additional article explains how the Impeachment process is possible and necessary even after the guilty perp leaves office, and how they can be used for prosecution of crimes. Those wishing to purchase over ten copies of the printed book can obtain them at discount from Feral House directly. Please contact info@feralhouse.com for costs. —Elizabeth de la Vega, Former Federal Prosecutor and author of United States v. George W. Bush et. al. — David Swanson, creator of ImpeachCheney.org, Washington Director of Democrats.com and co-founder of the AfterDowningStreet.org. Call attention to the blood already drained from our civil liberties and staunch the bleeding. —Brad Friedman, creator/ editor of The Brad Blog, and co-founder of the watchdog organization VelvetRevolution.us. Download the entire book free!